Pastor Wilson’s delegation comprising Adventist church leaders from Asia, Africa, Europe and North America, will be mainly here to participate in the 12th Global Leadership Summit which unfolds at the Iberostar Hotel in Montego Bay from February 4-8. 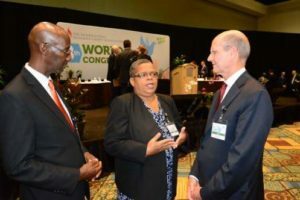 Pastor Ted Wilson, president of the Seventh-day Adventist World Church (right), and Pastor Everett Brown, president of the Seventh-day Adventist Church in Jamaica, listening keenly to Permanent Secretary in the Ministry of Justice Carol Palmer, a member of the church, during the International Religious Liberty Association (IRLA) 8th World Congress of Religious Freedom at the Diplomat Beach Resort, Hollywood, Florida in 2017. Pastor Wilson’s team will miss a session or two of the seminar to throw its weight behind the local church’s “Mission Project 2019”, which was launched on January 8 in partnership with the Ministry of Health and its Jamaica Moves initiative under the theme “Wholistic Health for Personal and National Transformation”.